Hope College will name a new center for musical arts, which will be constructed on its campus, in honor of Jack H. Miller for his lifetime of generosity to the college. 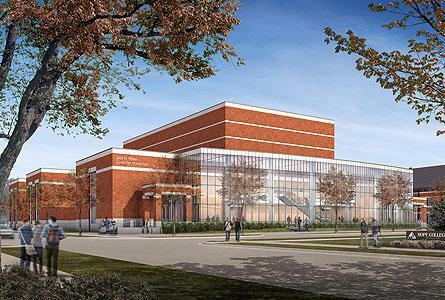 The “Jack H. Miller Center for Musical Arts” will include two performance venues, classrooms, practice rooms, faculty studios and office space for the department of music. The 64,000-square-foot complex will be built along Columbia Avenue between 9th and 10th streets. Miller’s major gift to the $35 million project, which includes construction costs and an endowment for maintenance, will enable the college to begin construction in the coming school year. The center will play an important role in both music performance and music education at Hope, in addition to serving as a venue for performances by community organizations. The building is a significant component of the college’s $175 million comprehensive campaign, “A Greater Hope”, now nearing completion. It was inspired by an initial lead gift to the campaign from Richard and Helen DeVos and brought to fruition by a major gift from Jack H. Miller. Jack H. Miller, who resides in Grand Haven, MI and Naples, FL, is a 1954 graduate of Hope College. He led the Howard Miller Company for 48 years until retiring in 2002. The company was founded by his father, Howard C. Miller, in 1926. The “Jack H. Miller Center for Musical Arts” will be located directly across the street from the Martha Miller Center for Global Communication, which was made possible by a gift from Martha Miller’s estate and other contributions from members of the Miller family in honor of their mother and grandmother. The Miller family’s involvement with Hope spans more than 90 years. Martha, who died in May 1999, was a 1924 Hope graduate. Jack’s siblings, Connie Miller ’58 Johnston and Philip Miller ’65, and all of Jack’s children: Sue Miller ’81 DenHerder, Buzz Miller ’84 and Meg Miller ’86 Willit are also alumni. The “Jack H. Miller Center for Musical Arts” will be an anchor of the developing arts corridor along Columbia Avenue between 9th and 14th streets. The arts corridor includes the college’s Dow Center - home to the department of dance, DeWitt Center - home to the department of theatre and Hope Summer Repertory Theatre, De Pree Art Center and Gallery, the Martha Miller Center for Global Communication, and the Kruizenga Art Museum (soon to be under construction). The “Jack H. Miller Center for Musical Arts” will replace Nykerk Hall of Music which was constructed in 1956 when Hope’s enrollment was 1,100 students. Enrollment this past year was more than 3,300. Hope College and Holland have never had a venue dedicated strictly for music performance. Over the years, musicians and ensembles have performed at the Holland Civic Center, area high schools, large churches, Dimnent Chapel, Wichers Auditorium in Nykerk Hall of Music, and the Knickerbocker Theatre. Groundbreaking could be as early as October of this year with completion anticipated in the fall of 2015. Hope College senior Cory Schmidt is being honored by the Michigan Intercollegiate Athletic Association (MIAA) as one of its outstanding senior athletes during the 2012-13 academic year.